Vientiane (VNA) – A scientific workshop featuring Ho Chi Minh’s thoughts on Vietnamese revolution and Kaysone Phomvihane’s thoughts on Lao revolution took place in Vientiane on August 30. The event was part of activities within the framework of a scientific cooperation agreement signed between the Ho Chi Minh National Academy of Politics, the Vietnam Academy of Social Sciences, the Lao National Academy of Politics and Public Administration and the Lao Academy of Social Sciences. 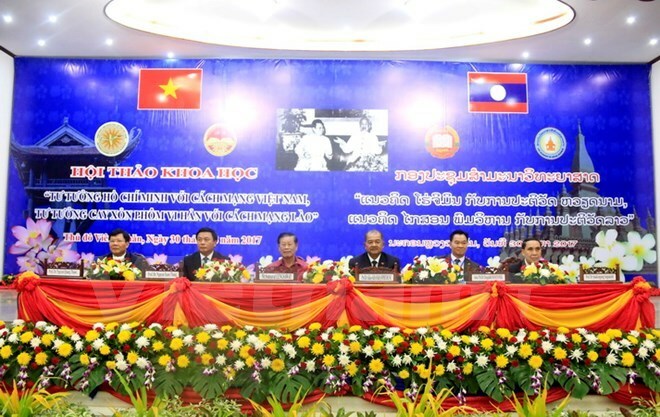 Speaking at the event, head of the Lao People’s Revolutionary Party Central Committee’s Commission for Propaganda and Training Kikeo Khaykhamphithoune hailed the workshop for enriching theory and reality treasures of the two Parties, contributing to refining policies and guidelines of each Party and State and bringing practical benefits to the countries’ people. More than 100 Vietnamese and Lao theorists and scientists delivered over 40 presentations on thoughts of the two preeminent leaders and their contributions to the Vietnamese and Lao revolutions, their influences in the country, the region and the world, as well as theories on Party and people’s administration building, among others. Participants agreed to facilitate exchanges between the four academies and the two nations in order to popularise Ho Chi Minh and Kaysone Phomvihane’s thoughts on Vietnamese and Lao revolutions, respectively.